While all the rumors suggested Microsoft was going to announce a teeny-tiny Surface RT today, but instead we got a big (and promising) Surface Pro 3. What happened to the mini? According to a report by Bloomberg it was a thing, and then Microsoft nixed it. Smaller tablets are all the rage, but according to sources cited by Bloomberg, Satya Nadella and Stephen Elop a mini Surface wouldn't be different enough from its competition to succeed. It had been in production though, with plans for a reveal that could have happened as early as today. 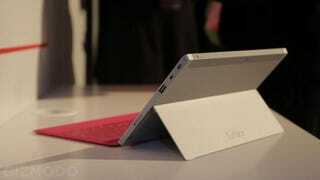 Microsoft is still apparently working on other ideas for a small Surface, but there's nothing imminent. In short, Microsoft decided it couldn't beat the iPad (mini).